Four-year-olds in England are to be offered free flu vaccinations for the first time as part of the annual drive to get people protected before winter. 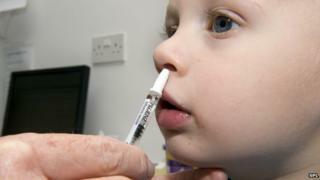 Public Health England (PHE) wants widespread vaccination to stop flu spreading to "at risk" people. These include pregnant women, young children, over 65s and those with conditions such as asthma and diabetes. Last winter 904 people were admitted to intensive care with flu and 98 of them died. Children up to the age of three were eligible for free vaccination last year, and four-year-olds have now been included. For those aged two, three and four, this is given as a nasal spray rather than an injection. Flu viruses constantly mutate so a new vaccine is devised each year and annual jabs are needed to stay protected. Media captionDr Paul Cleary, Public Health England: "Children are very good at spreading infection around"
Flu has been comparatively mild in recent years, and health officials are concerned this could lead to complacency. Prof Dame Sally Davies, the chief medical officer for England, said: "Flu is a really unpleasant illness, particularly for our most vulnerable patients, and it is essential that people take steps to protect themselves during the winter months. "Women can safely have the vaccine at any point during pregnancy and it can reduce the risk of complications such as pneumonia and premature birth, that can arise as a result of flu," he said. The government's Joint Committee on Vaccination and Immunisation has advised offering free flu jabs to all two to 17-year-olds. PHE is in the process of extending the coverage. Similar vaccination schemes operate in Scotland, where two million people are to be offered free vaccination this year, Wales and Northern Ireland.